2. 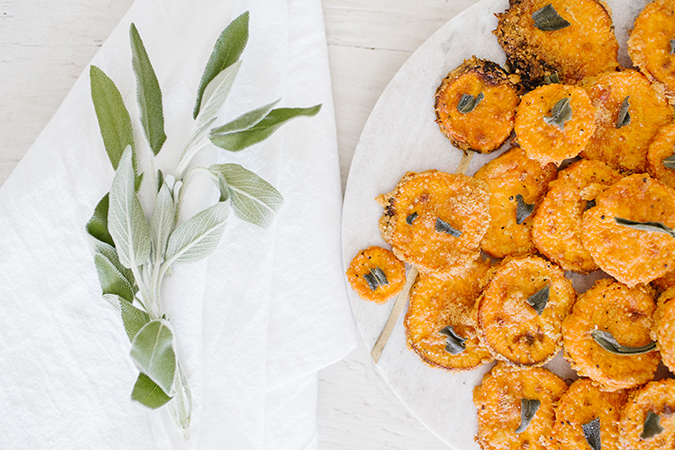 Put your sweet potato rounds into a large Ziploc bag with the 3 tablespoons cornstarch. Give the bag a good shake until all rounds are evenly covered. 3. Move rounds into a medium mixing bowl and add avocado oil. Toss as you’d toss a salad until rounds are covered. Add parmesan cheese, salt and pepper, then toss again until mixed. 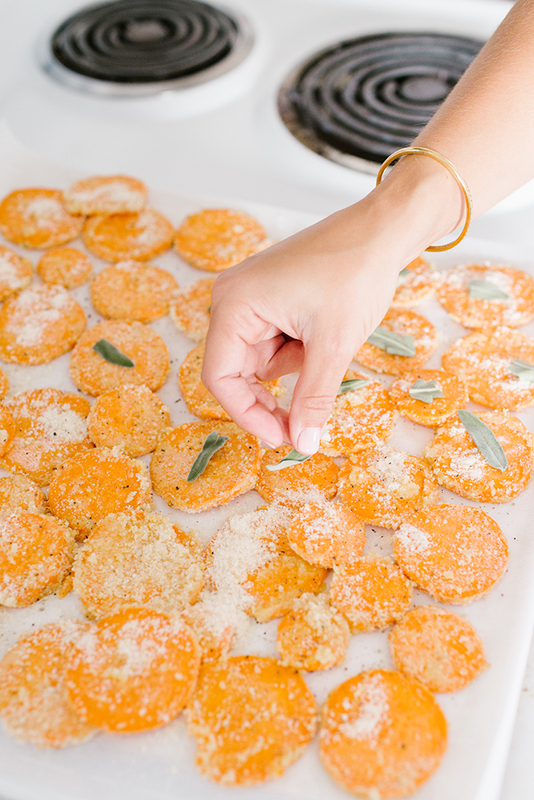 Note: I add a lot of parmesan cheese to my rounds, but you may adjust as you please. 4. Cover a baking sheet with parchment paper and place rounds in a single layer on parchment paper. Use more than one pan if necessary, but don’t add a double layer as this won’t achieve crispness. 5. Pick off fresh sage leaves from stems and place on each potato round. Add more parmesan, salt and pepper if needed. 6. Bake for 20-30 minutes or until rounds are nice and crispy, with the outer rounds turning golden brown. 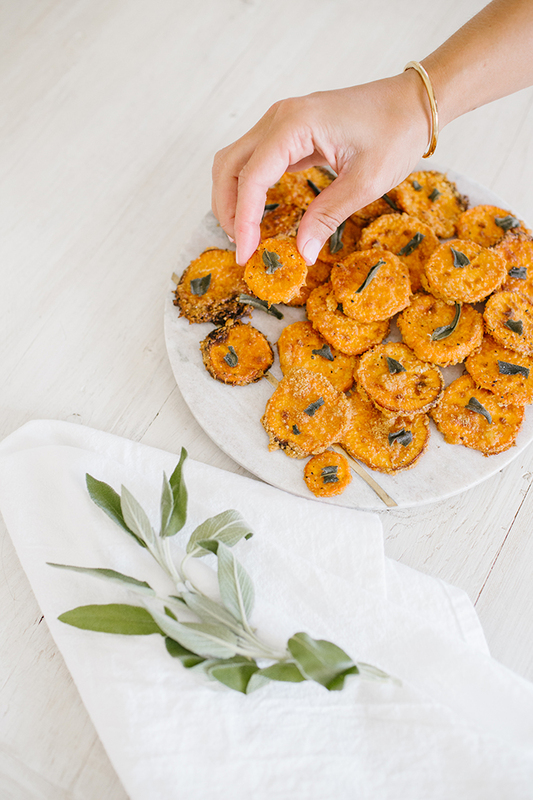 You may serve these with your favorite dipping sauce if you’d like, but they are just as delicious on their own! Also, the more you make these, the more you will figure out your own preference on the amount of cheese, sage and bake time. I’d love to hear in the comments below if you make modifications to your crisps and how they turn out! 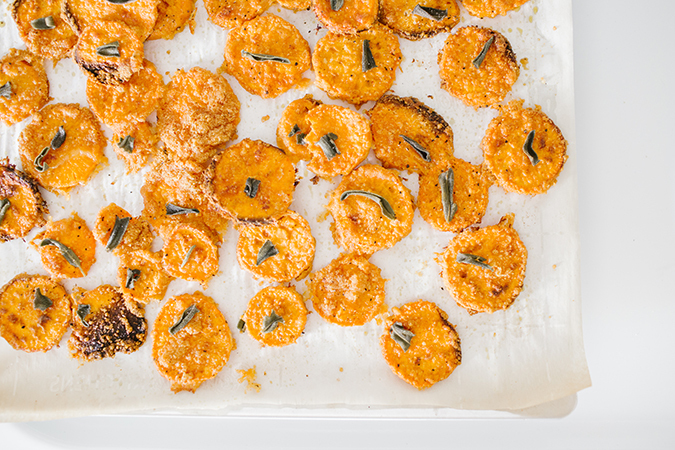 Will you be giving these sweet potato crisps a try?